It’s the first Friday in February, and that means it’s giveaway time! This month’s giveaway is all about color—colorful pens, colorful markers, colorful stickers, colorful notepads. Oh, and there’s also an adorable plush giraffe that’s looking for a home. The giraffe appeared in the Dr. Seuss tale And to Think That I Saw It on Mulberry Street. I’m thinking that if given the chance, he could also star in Giraffes Can’t Dance by Giles Andreae and Guy Parker-Rees! Since this giveaway is all about color, leave a comment on this blog that tells us your favorite color and you’ll be entered for a chance to win February’s giveaway prize. Just be sure to leave your comment before midnight February 12, 2017. We’ll announce the winner right here on the blog, and we’ll also notify the winner at the email address used to submit the comment. Congratulations to Sarah, who left comment number 158. She is the winner of this month’s giveaway! Royal Blue – ’cause it’s ROYAl and Blue, too! Blue and green because I love blue skies and green grass! I love blue, so soothing! I just love pink! ? My favorite colour is Magenta. And I love both of these books. It is truly wonderful when we can use a prop with the story we are telling to the children, or have a prop available for them to tell the story! Love Mailbox! Favorite color is blue!! Happy February!! My favorite color is blue. I find it to be a relaxing and calming color. I would paint my preschool classroom blue if I were allowed to. This is an awesome site everyone should go gold!!!! Pink, it is bright and colorful. Teal. I’m really drawn to it. I love purple. Purple cows are great. Yellow is so bright and cheerful like the giraffe in the two stories!! Our sky is Blue today! Awesome winter scene with crystal white snow! Purple is positively popular in my wardrobe and library walls! Ocean blue. Wish I was there now. Not a bright and cheery color, but it looks good on everyone. BLACK! I love purple such a rich and happy color. I love purple- the darker, the better! I love pink. All shades of pink. It’s a happy color! I love the color blue, any shade, it reminds me of the ocean. I am passionate about purple! It is a royal color. this is right up my kids alley! My favorite color is orange. My 3 yo loves green, 5 yo pink, and 8 year old purple! Blue is beautiful…and delicious in the form of a blueberry! I love lime green and pink! I love anything and everything teal! It’s so beachy. Red is my favorite and really gets my blood pumping! I like all colors (my students invariably ask me each day, “What is your favorite color?” in order to make me a wonderful creation). I guess my favorite is peach; it is flattering to all skin tones; bright, without being overwhelming and fits with all seasons! Purple is my favorite color. there are so many shades. Yay! I love colorful pens. The kids think it is so fun to write with them! I love mint green! Its my all time favorite. I love to wear the color purple. It is my favorite color. I love purple. I correct my papers in smelly markers! The kids love it! Blue, preferably denim blue. It just seems to be a cozy, warming color. I think green is great and groovy but blue is beautiful and best! ? Purple! Violet! red violet! Blue violet! I l-o-v-e PURPLE! I love green!! My favorite. ? Pink…I never leave the house without something pink on. A jewel toned royal blue! Yellow! It’s bright, happy and rejuvenating! Always makes me smile. Pink! I think it’s just a fun color. Mailbox is my survival tool for kindergarten! My favorite color is teal!! Blue! So calm, quiet, and serene … just the thing for teachers after a long week of teaching! I have always loved the color blue! I love sparkly colors…gold, pink, teal. All my kids love them so much…they brighten even the greyest days….just like my precious students. I love a bright blue. My favorite color is Kentucky Wildcat Blue. Thanks for the contest. GREEN. Especially kelly green and lime green! My favorite color is navy blue … love this idea! My favorite color changes by the day. Today it is purple. Purple and I absolutely love giraffes! Turquoise blue…it reminds me of the Keys. Blue, Blue, Blue, I sure like You You YOU!!!! Pink. Love the Mailbox and Dr. Suess! My favorite color is purple. Funny thing is I don’t own anything that’s is the color purple. Green – makes me think of summer ? My favorite color is gold, it is so shiny and rich!. My favorite color is rainbow! It goes with everything. I have a very old copy of “…Mulberry Street” that I read to my preschool 4s class. My favorite color is purple; any and all shades and tints! I love the color pink – it is bright and cheery. Our preschool is painted yellow however – I find this color to be a great color for our school. It is a happy color and goes with anything. Black!!! Every color looks great with it- love doing colorful projects and mount them on it – and of course you look awesome wearing it!! Tough one! Love pastel colors…they’re all my favorite! Yellow! With orange a close second! Bright and fun, just like that giraffe! Aqua – makes me think of the ocean. I love the color blue! It can be found in so many shades and is super calming. Turquoise…like the ocean on a summers day….so relaxing, calm and worry free! Magenta- giggles cause it makes me laugh each time I say it. Blue and I LOVE giraffes!! I love all the colors!! I tell the children I love them all because each one helps make a beautiful picture!! My favorite color is pink ??. I love pink so much…. reminds me of hearts. Pink has been my favorite color since childhood. Green, the color of Spring. I can’t wait for the green grass and flowers. Yellow! It’s such a cheerful color, it makes the drab days of winter seem not so bad. Blue is my favorite color. I love all shades of blue! Love the sweet giraffe too! My kindergarteners will give it a good home! My Favorite color is yellow for the sun! Blue and purple are at the top of my list. We love Dr. Seuss! PURPLE!!! I love all shades of it. It is the color of royalty:) I get happy when I see it! I love the soft tranquility of blue, and the boldness it can become to show perseverance. The color green – it reminds me of spring! Blue it is so calming. But love all the colors of the rainbow. Green is my favorite color; the darker the better! My favorite color changes with my mood, but much of the time it’s a cool color (blues, purples, pinks). Yellow – It reminds me to start each morning with a smile! I love both sea glass green and mermaid tears blue. They are both calming and mysterious. Add a little dinglehopper silver, and some bright white and it’s an under the sea adventure. Could you imagine Ariel’s name for each color or even a giraffe?! I love the color black because you can wear it almost any color. It really stands out. Green! It’s a beautiful color that brightens the world! Purple. I always feel good in that color, and its my school color. That giraffe would be so loved in my media center! Red! Cute giraffe. My class would love it. My favorite is blue, but I love any color that is super bright like neons. I LOVE RED! Bright red like the color of red roses and cardinals! I love to see a bright red Cardinal at my feeder against a fresh white snowfall!! Brightens the winter scene! Blue, Carolna blue! That’s the color of the sky here in our new home state! The 2 year old that I am a nanny to, absolutely loves the book, Giraffes Can’t Dance. I love orange! It bright and lively like my students. Yellow – bright and happy! Sunset orange is the best because it always promises a new beginning of tomorrow’s potential. Yellow. You never have a dreary day when yellow is around. As we sing our valentine songs and make our valentine cards and gifts, I have to say RED!! Thanks for the super ideas just when we need them, and for the contest! I love colors…tough to pick just one…guess lately it’s been Aqua. Yellow! My preschoolers will say Miss Linda your favorite color is yellow. Right? This happens whenever we are working with colors. I love Purple…with teal coming in a close second. Yellow and Orange are such fun colors! They put you in a happy mood! I love all the colors so I answer the question of “What is your favorite color?” with a response of “Rainbow”. I tell my students that there is no such thing as girl colors or boy colors because God gave us all the colors for everyone to enjoy. Blue is definitely my favorite color! Though as an emotion it seems a sad color, I teach my students that every color can have its own meaning for you. Blue, for me, is love and happiness. What a cute giraffe! My favorite color is blue. Silver sage, a beautiful pale blue green with a hint of gray. Very calming. Purple and yellow are my favorite. Green! The color of spring: new grass, beginnings of flowers and leaves on trees! Green, green, and more green! A rainbow has all the colors I like-just like the rainbow within my classroom! Purple! I would love to win! My favorite color is yellow. It just makes me happy! My favorite color is any shade or hue of purple. In fact, my daughter is using it in her wedding colors because she loves it was well. Magenta is the best. The giraffe is darling!!!! My favorite is aqua, reminding me of water and calm. Orange because it is bright. Indigo – I used to work in a double classroom called Indigo – My favorite class ever. love every shade of blue! I love green. All greens! I love aqua – the color of the calm, serene ocean. I love the color purple. I like the pure innocence of it. Green as my eyes has alway been my favorite. Orange – the color of happiness 🙂 That giraffe is adorable! I love lime green!! It is so bright and cheery. The Mailbox has so many wonderful activities to share. My favorite color is blue. Love the Mailbox ideas!! I really don’t have a favorite! Blue and purple are at the top but I like everything to be colourful!!! Hot pink…bright and makes you feel happy ? Dr. Seuss is my fave!! I love blue. Yellow because it is s bright and cheery color. Yellow is a happy color that brightens any day. My favorite color is GOLD!!! 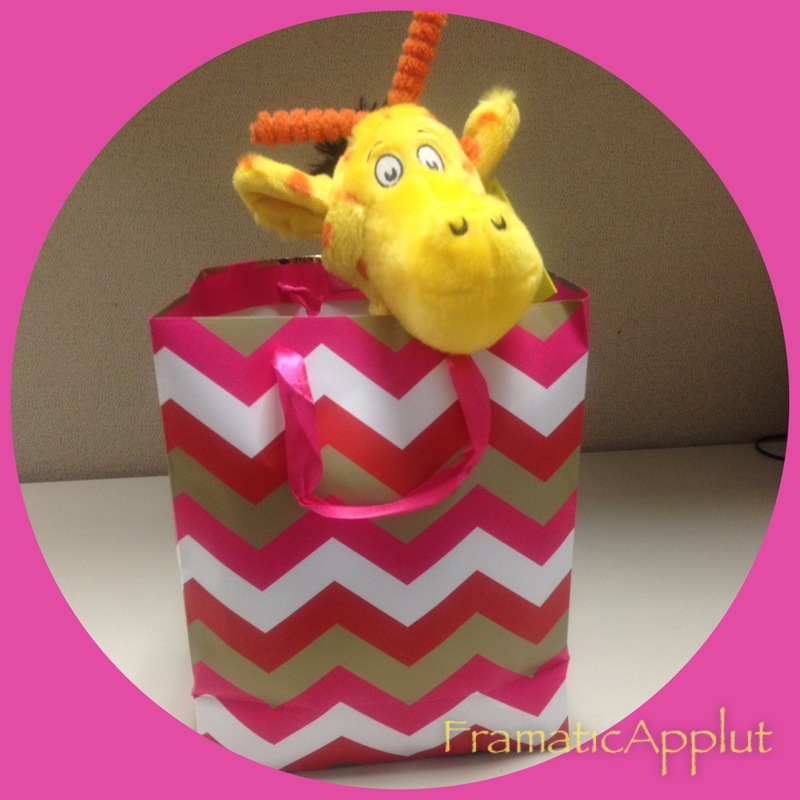 But….I also love bright colors such as yellow like the cute giraffe in the bag and light blue like in a sunny day! My favorite color is blue – all shades of blue. My favorite color is yellow, the color of sunshine (and the giraffe). I love yellow just like the giraffe! Red. It is a happy color! Neon green sure is keen!! I love orange, it reminds me of summer! I love hot pink…..and Dr. Seuss too!! The color that makes me feel most calm is olive green. I have it all thru my house. BUT – I wear a lot of pinks because I like the energy I feel when I wear it. It’s a giraffe!!! Love Giraffe’s!!!!! My favorite color is RED. That is my make me feel good, power color. If I know I have ucky things to do on a specific day I just wear red and it’s not such a icky day after that. Purple!! all shades from regal to calm lavender. And who doesn’t love markers?? All Autumn colors! I love reds, oranges, yellows/golds, and browns. It makes me feel all warm and soft inside and out! Thanks for the opportunity to win and share the “colo” and giraffe with my students! As I always tell my students, my favorite color depends on what it’s on. I love pink, but I wouldn’t want a pink house or car. Colors are so much fun, and it is possible to love every one of them at any given time. My favorite color is purple. It is a symbol of royalty. I love the richness and boldness of the color. What makes it even more special to me is that it is also my oldest granddaughter’s favorite color…she is 5-1/2 years old. Wow! believe it or not that’s a hard question…I love COLOR, and have so many favorites. But if I have to choose just one it would be one that’s really not a color at all…WHITE! It makes me happy and reminds of what’s still clean and pure,(LIKE BRAND NEW SOCKS LOL) in this challenged world we live in. I love purple! Fingers crossed to win! Turquoise Blue/Green – This color reminds me of ocean waters, soothing and serene! My favorite color is blue. Any shade will do! Red! I love red! It’s bright and beautiful. I teach preschoolers, and they need to learn the basic eleven colors for kindergarten. Therefore, I like different colors like peach, teal, lavender and turquoise, so they can learn a few more colors for kindergarten. Bright colors, blue, green, coral, pink, – I love them all. Thank you! My favorite color is YELLOW! I love sunny days! While all the colors are beautiful in their own way. My all-time favorite happens to be blue. I love red and blue and can’t decide which is best, so I choose purple! My favorite color is blue. It reminds me of the color of babies eyes beautiful and innocent. Orange and yellow make my favorite color of the sunset. I love all the colors of the rainbow especially the shades of blue/purple. Light Blue….it makes me think of the sky floating over the ocean. My new favorite color is red! Never used to like it but I needed a change this yr so I changed my fav color too and its fun! Red – Because its all about the Love. To be honest, Periwinkle is really my favorite, but I equally love :YELLOW; It has always been the color that cheers me up. I’m fussy about ‘which’ color of yellow, I’ll admit. 🙂 To me yellow is just happy. And if it’s the right shade it goes well with several colors. My favorite color is pink. I know it can seem cliche for a female, but I just love it! My favourite colour is green. To me it signify s spring and a new start after a cold winter. I love deep golden yellow the best! Love blue like the ocean! Love the color blue–any shade! My favorite color is cerulean! My favorite color is Purple!! Thank you for the opportunity to win! All the colors if the rainbow! Rainbows make me happy! Love mailbox! Blue is my favorite color. My students and I love Dr . Seuss books. Thank you for the chance. My favorite color is yellow because it’s so bright and cheerful! I love green! All shades of green! Lime green, dark green, grass green, etc! I love frogs and my students love them too! So green is a perfect color for this frog loving teacher. Purple is my favorite color!? If you ask my students, they would tell you purple was my favorite color, but in reality, it’s grey. My grandmother’s eyes were grey and they fascinated me so much as a child that now every time I see grey, I think of her. I love the color purple! I love green. The color of nature. Mine has to be royal blue because it’s such a rich, vibrant color! RED!! I have a Dr. Seuss classroom! Perfect addition for it! Purple is the best! My toddlers love singing about colors in English and Spanish! They would love the giraffe too! I love GREEN- Feel the grass, see the trees, being happy- “that’s ME”! I’ve always loved the color purple! I love purple and green. They have always been my favorite. My kids would love that giraffe. He would be an awesome addition to our classroom! My favorite color would be orange but I also love pink! Can’t go wrong with PURPLE! Blue! It is so relaxing. Currently, I am obsessed with teal blue and gray!!! Jade (green). Colorful pens, colorful notepads, colorful markers and stickers! ?? My favorite color is green. It reminds me of Spring and renewal. When everything begins to grow. It’s a bit of happiness when we leave behind the drab colors of winter. Any color of green! Because I’m Irish! Purple is definitely my fav. Mocha, it is warm and soothing. Purple! I don’t know why but I guess it doesn’t need an explanation. It’s a color that makes me happy! Pink is my favorite? Love Mailbox!! I love green!!! AND I love my Green Bay Packers! PINK reminds me of my granddaughter, Josie! Pink is her favorite color! Blue! The color of the ocean and summer skies! I also love the giraffe! Pink! It’s a color that can bring positive thoughts! Red! It’s been my favorite since I was probably six. This would be awesome to get, as I’m soon to be a first-year teacher! I’m graduating in May. Purple!! It’s just the best!! My fave is always RED! Hope I win, I need more Reading buddies! Love this! My whole classroom is Dr. Seuss theme. Favorite color is pink! Yellow……it makes me think of sunny days ahead during the gray winter months. Yellow is my color!!! It reminds me of the warm summer sun!!!!! Cornflower blue. Our wedding was this color almost 20 years ago. Still my favorite. Like all the “colorful” personalities in my three year old class, I would have to say my favorite color is the rainbow, because I can’t say which is my favorite since I love them all, like I love all my kids!! Thanks for all the wonderful ideas you always share with us!! Love the color blue!! Such a fun prize! Would love to win!! ❤️ ???? My favorite color is purple but for a long time during g my teens I was always team red. Pink. My students love Dr. Seuss books!! Red. Not pink. Not a dark shade of pink. Good old fire engine red. It’s too hard to choose just one color! Purple, blue, green, and pink are my favorites! My favorite color is pink. I like all shades of pink. Purple…and my classroom is decorated in giraffes! I love this one too! My favorite color is purple. Been teaching preschool for over 30 years and always have a lots of color in my classroom. Ocean blue/turquoise…so calming and gorgeous! Especially if its dark and jewel like! Purple and teal are my favorites. I love them together, but if I had to pick only one, purple would win every time. Green is my favorite color. It has been ever since I was a little girl. It is such a calming color, yet can be very vibrant. Green is the color of trees and the plains which is were giraffes live, which also happens to be my favorite animal. Purple _ love all its shades ! I love red and turquoise…..especially together. Blue and just about any other color. I love any shade of blue. I wear it so much my students notice! Thanks for the chance to win. I love royal blue. Thanks for the chance to win a free gift. I’m excited! My favorite color is green. It is the color of all things outdoors:leaves, grass, plants, moss, etc. Green is my happy color!